The bench perss improves upper body stretch to help your golf game. You can greatly improve your golf game by spending some time at the gym and performing certain exercises to strengthen muscles used in the game. Body balance and flexibility are both important for a good performance on the course, and also help prevent injuries. It’s important to start your golf gym exercise regimen with a stretching and flexibility exercise. This will eliminate injury, both in the gym and on the course. As you become more flexible, you will see your golf swing improve. Hip stretches will also work to increase the flexibility of your legs, back and stomach muscles. Lay flat on your back on a gym mat, with your arms straight out from your sides for balance. Leave your left leg straight, while you lift your right leg straight up in the air. Swing your right leg over the left one to the left side, continuing to keep both legs straight. Hold the position for a count of five. Increase the count as you become more flexible. Repeat the process for the opposite side. Weight training for golf should focus on the muscles used during the game. Deadlifts (lifting a barbell with weights from the floor to the waist) are excellent for overall body strength, particularly in the back, thighs, calves, arms and core. All of these areas of the body need strength to complete a better golf game. Strong legs are important for agility and speed. The back needs strength for balance and for a strong swing. Core strength helps your swing, balance and endurance. The amount of weight lifted should be discussed with a professional trainer. 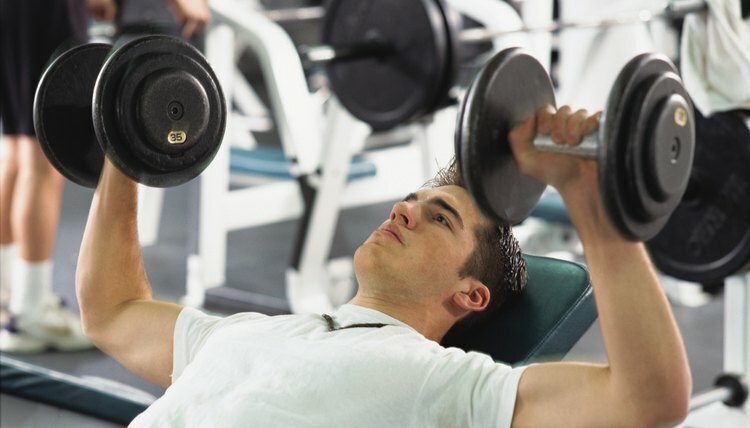 The bench press (on your back, on a bench, lifting weights at the shoulder) improves upper body strength, chest, triceps and shoulders, all important to the golf swing. Use an exercise ball for lower body balance and strength with squats, improving your golf swing and game endurance. The ball size depends on your height, so work with a trainer to assess the right size ball for you. Place the exercise ball against a wall with the small of your back to the opposite side of the ball. To start, your legs should be slightly bent and your feet slightly angled forward from your body. Your arms should be straight out in front. Push against the ball, while bending your knees and moving down the wall, with the ball. Your knees should be behind your toes as you go down. Do not strain yourself if you are just starting an exercise program. Go down as far as is comfortable. As you progress, let yourself go farther down the wall, with a deeper bend until your knees are perpendicular (90-degree angle) to the wall. Press on your heels to push yourself back up slowly. To begin, start with five repetitions, increasing as you progress.